Whenever you drive a long highway or the interstate in the US, you would see a couple of billboards every so often and it might detract your attention away from the beauty of the landscapes that you pass by. Though these locations are the ideal placements for these billboards since there would be tons of people who would see them, what would be the use if these will just ruin the view of your road trip? Artist Jennifer Bolande found a clever way of marketing these billboards and presenting them to motorists. Instead of showing various products and personalities advertising them, she painted the billboards illustrating the part of the background scenery that they are covering. They were installed along the Gene Autry Trail in California. As you pass along the road, given the right angle, you would be able to see a beautiful landscape where these picturesque paintings blend in with the background creating a life-size still. It might actually add something a little bit more than the real thing as these paintings would exude a certain texture, lighting, and depth giving life to the picture. Bolande had the idea for this project called Visible Distance / Second Sight as a part of Desert X. 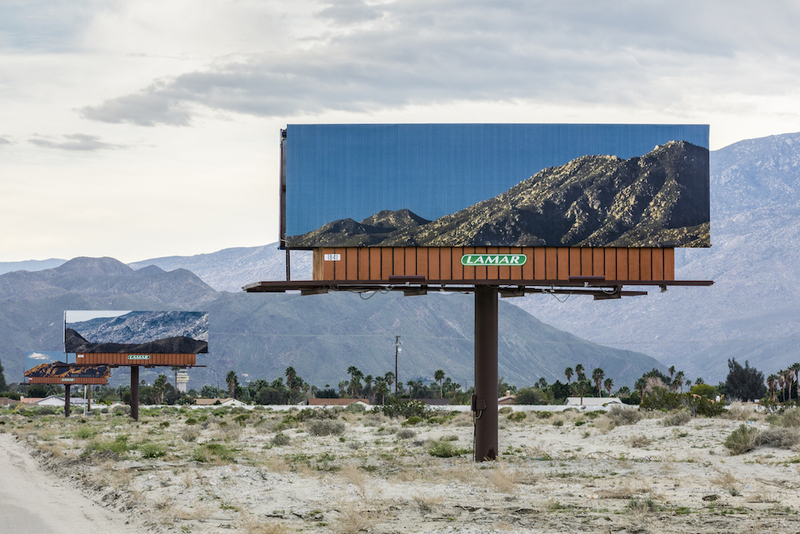 According to the Desert X page: “Each photograph is unique to its position along this route and at a certain point as one approaches each billboard, perfect alignment with the horizon will occur thus reconnecting the space that the rectangle of the billboard has interrupted. With these incredible ads, the Desert X project wanted to highlight various social and environmental issues plaguing the world today including climate change and global warming, tourism and immigration, and even gaming and golf. Truly, this is creativity that transcends the boundaries of the ordinary and mundane, proving that marketing does not need to be loud or forced to be effective. You can use a more subtle approach, even using the backdrop of the ad itself to make a statement. Not only do these ads illustrate the majestic sights that they cover but they also raise awareness for motorists and people driving by these roads to give them a different perspective about the issues that they present.